A Hasidic camp in a central Ukrainian city, which was preparing to welcome thousands of Orthodox Jews for an annual pilgrimage, was destroyed after an alleged “collective” decision by locals. Police stood idly by as about 30 men wrecked the camp. The group of “athletic-looking” young men equipped with hammers and other “carpenter tools” destroyed a fence surrounding the Hasidic Jews’ camp in Uman on Saturday, Ukrainian media reported. The attackers then knocked down lamp posts and damaged security cameras, threatening to return a few days later. The incident, described by the pilgrimage organizer as “a provocation against Ukraine,” happened at noon on Saturday, when the believers were “particularly vulnerable.” He placed the damage caused by the attack at $500,000. “On Shabbat, when they knew we wouldn’t be able to respond or activate the communication device, they simply knocked down the fence, pushed the light poles and security cameras, and caused damage estimated at half a million dollars,” Eliezer Kirshboim, chairman and director of the Jewish association in Uman, told the Israeli daily Yediot Acharonot. Meanwhile, the leader of the attackers, known as Voulya, told TSN.ua that the decision “to take down the fence was taken on a collegiate basis.” No one has been charged in the attack so far. This is not the first time the annual pilgrimage to the burial site of Rabbi Nachman of Breslov, which at times has attracted tens of thousands of Orthodox Jews, has caused frictions with the locals. 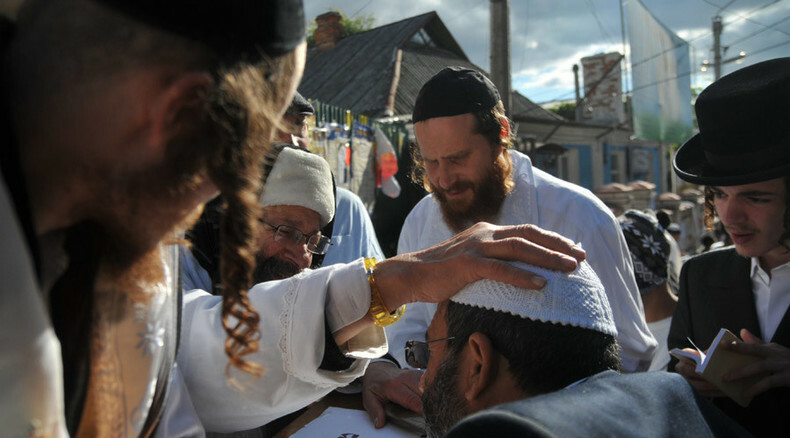 In 2010, when some 30,000 Hasidic pilgrims came to Uman, local media reported that “aggressive behavior” by some Orthodox Jews had resulted in conflicts and brawls with residents, requiring riot police to intervene. The Times of Israel noted that many locals “resent the cordoning off by police” of a number of neighborhoods reserved for the pilgrims. However, things have apparently only got worse in the Ukrainian turmoil, with nationalist, and at times, openly neo-Nazi parties coming to power locally. According to Kirshboim, the current mayor of Uman was “appointed” by members of the far-right nationalist Svoboda party, which was recently implicated in deadly clashes in front of the Ukrainian parliament in Kiev. “There is crazy state of anarchy here,” Kirshboim told the Times, adding that right-wing “activists” have been harassing Jews to score political points among the local population. “Whoever harasses the Hasidim more has a better chance of winning the elections in October,” the Jewish leader claimed. In a wider context, this is only the latest case of anti-Semitic violence in Europe in the last two-three years. Jews have recently been leaving Ukraine by the thousand, according to Joel Rubinfeld, president of the Belgian league against Anti-Semitism. “It’s not a coincidence that last year the biggest increase of Jews leaving their countries worldwide, the biggest increase that we noticed, was Jews from Ukraine. Last year only, 6,900 Ukrainian Jews left their country to go to Israel,” Rubinfeld told RT. As of Tuesday, about 1,500 Orthodox Jews had arrived in the town where the sacred tomb is located, but up to a total of 30,000 worshippers from a dozen different countries are expected to visit the site over the week. A joint police squad, which patrols the place night and day, includes 15 Israeli police officers, the press center of Ukraine’s Ministry of Internal Affairs’ regional office said. The pilgrimage to Rabbi Nachman’s gravesite takes place every Rosh Hashanah, the Jewish New Year (in 2015, it falls on September 15). Over 200 years ago, the rabbi encouraged his followers to spend this holiday in the town with him, promising absolution from sins.